Eine Übersetzung dieser Biografie folgt. The Mariinsky Academy of Young Opera Singers was established in 1998. The Academy’s Director Larisa Gergieva is a widely-known figure in the music world, an accompanist, a world-renowned teacher, General Director of the International Rimsky-Korsakov Competition, a jury member of numerous international opera singers’ competitions and Artistic Director of the International Summer Academy in Mikkeli. The Academy of Young Singers has become a post-graduate institute for young performers – a bridge between conservatoires and theatres on one hand, and on the other a perfect analogy of an apprentice group, a common practice in opera houses. In the fifteen years since it was founded, the Academy has trained several generations of young singers. Each year the Academy admits new young singers who come from throughout Russia, the CIS, Europe and the USA. The Academy offers its students unique studying conditions: while studying under talented teachers they assimilate the culture of singing, develop a sense of style and study foreign languages and the history of the Mariinsky Theatre and world opera. Moreover, the students have wonderful opportunities to attend master-classes given by acclaimed singers, which together with experience of performing on the stage serves as a sound foundation for training opera soloists of the future. Soloists at the Academy are actively involved in Mariinsky Theatre productions, performing lead roles as well as minor ones. Not a single production at the theatre does not involve the participation of the Academy’s soloists. Over twenty operas have been staged at the Mariinsky Theatre for the Academy’s soloists, among them Rossini’s opera Il viaggio a Reims (which received Golden Mask awards in the categories “Best Musical Production,” “Best Director” and “Best Female Role.”), Rimsky-Korsakov’s operas The Golden Cockerel, The Tale of Tsar Saltan, May Night and The Snow Maiden, Prokofiev’s opera The Love for Three Oranges, Mozart’s opera Die Zauberflöte and the world premiere of Gogoliade (three one-act operas by contemporary Russian composers based on works by Nikolai Vasilievich Gogol), which received the special award of the Expert Committee of St Petersburg’s Golden Sofit theatre prize, Alexander Smelkov's opera The Station Master, Frederick Loewe's musical My Fair Lady, Jules Massenet's opera Don Quichotte, Pyotr Tchaikovsky's opera Eugene Onegin, Modest Musorgsky's operas Salammbô and The Sorochintsy Fair. It is impossible to imagine music in St Petersburg without the vocal concerts of the soloists at the Mariinsky Academy of Young Singers. 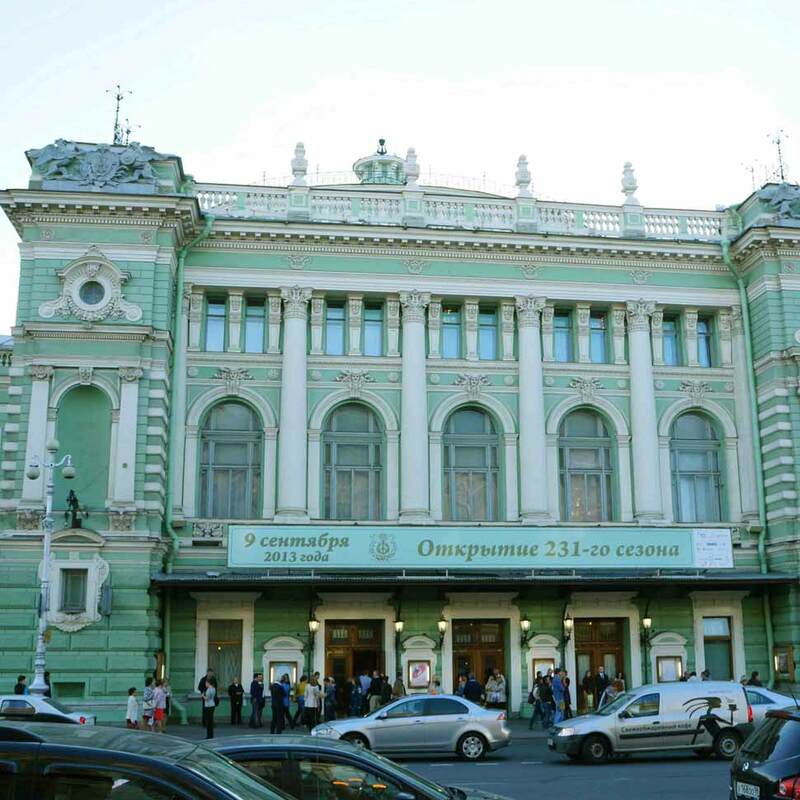 Their performances at the Mariinsky Theatre, the Great and Small Halls of the Philharmonic, the Yusupov Palace, the Fyodor Chaliapin Memorial Apartment and the Hermitage Theatre among other prestigious city venues have long been a fine tradition. Playbills for concerts featuring the names of the Academy’s soloists may be seen in towns and cities throughout Russia, the CIS and abroad. Their sense of professionalism and art and their unique performing style have been highly praised by music-lovers in Moscow and Smolensk, Yaroslavl and Arkhangelsk, Murmansk and Ulyanovsk, Vladikavkaz, Tallinn and Elista among other cities. Many of the student’s concert performances are held abroad. In recent years the touring map of the Academy’s soloists’ concerts has taken in dozens of towns and cities in countries including the UK, the USA, Italy, France, Finland, Portugal, Spain, Hungary, Poland, Belgium, Canada and Japan. Soloists of the Academy of Young Singers who have won Grand-Prix, awards and diplomas at the most prestigious international vocal competitions on numerous occasions are actively involved in many music festivals, both in Russia and abroad.